JAI has announced the launch of three new 1.6-megapixel 3-CMOS industrial cameras in the company’s Apex Series of prism-based color area scan cameras. The new Apex AP-1600T models join the 3.2-megapixel AP-3200T models launched earlier this month to create a new generation of prism-based industrial R-G-B area scan cameras, offering better color fidelity and spatial precision than traditional Bayer color cameras. The three AP-1600T cameras are: the AP-1600T-USB, with a USB3 Vision interface; the AP-1600T-PGE, with a GigE Vision interface; and the 1600T-PMCL with a dual Mini Camera Link interface. Each of the models features three PregiusTM IMX273 1/2.9-inch sensors with 1456 x 1088 pixels and pixel sizes of 3.45 µm x 3.45 µm. All three models can be powered via a 12-pin Hirose connector that also provides various trigger and I/O connections. The AP-1600T-PGE and AP-1600T-PMCL models support power over their respective interfaces to minimize cabling. 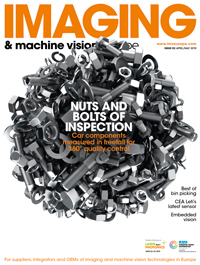 Like the previously announced 3-CMOS Apex Series cameras, these new models deliver higher throughput than their 3-CCD predecessors, making them suitable for more color machine vision systems than ever before. For example, the AP-1600T-PMCL can output as much as 3 x 1.6 megapixels at 126 frames/second, which is nearly 5 times the throughput of earlier 3-CCD models. The AP-1600T-USB features a maximum full frame rate of 78.8 frames/second, while the AP-1600T-PGE runs at up to 24.2 frames/second over a single GigE Vision connection. In addition to higher throughput, the new Apex Series cameras are loaded with a range of advanced features and functions supporting the most challenging color imaging applications. The color space conversion tool provides great flexibility in on-board color space conversion: including RGB to HSI color space conversion and RGB to CIE-XYZ color space conversion. (sRGB and Adobe RGB color spaces are also supported). Other features include multi-ROI support, edge enhancement, Auto Level Control (ALC) which integrates auto gain and auto shutter functions, color pixel binning, and chunk data. The new 3-CMOS Apex Series models utilize an innovative prism design making them more than 50 percent smaller and nearly 50 percent lighter than JAI’s previous 3CCD models, despite having much higher resolution. The cameras are robustly built with a 50G shock rating and 3G vibration rating which, combined with an operating temperature range of -5°C to +45°C (ambient), enables the AP-1600T cameras to operate reliably in a wide range of industrial environments.